SHANNON SMITH: The Hulk prefers Grape. Hoo boy I'm busy. Are you busy? Dang we are so busy. I've got about 20 to 30 pages of comics that I need to draw/ink/letter/scan/print/etc. over the next couple of weeks so I've been drawing at night a lot. I spend most of my daylight hours dealing with work and that lady and her two kids that live in my house and call me Daddy. Like a lot of artists, I needs me some background noise when I draw just to keep the brain working and to stay awake. Music works. TV shows also work. The nice thing about drawing with TV shows on is that they work like an alarm clock. If a sitcom ends then you know you just knocked out 22 minutes. If a drama ends then you know you just knocked out 44 minutes. The trick is to pick a TV show that you won't mind ignoring. Preferably something you've already seen a few times. 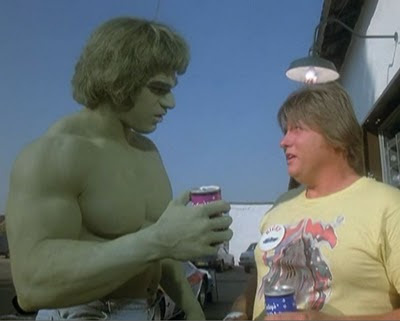 As the millions of people around the globe that live their life from one Shannon_Smith tweet to then next can attest, lately I've been drawing to The Incredible Hulk on Netflix. 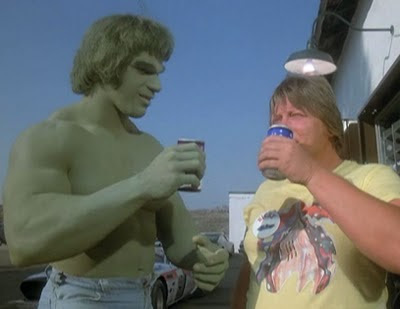 I love The Incredible Hulk. Certainly one of the best American TV shows of all time. It has Bill Bixby in it. That pretty much makes it better than any show without Bill Bixby right out of the gate. And it's a great to draw to because it has such a strict formulaic pace to it. It's like music. The Bixby rolls into town and gets a job as a janitor. The Bixby befriends a co-worker. The Bixby smells trouble. The Bixby immediately butts his nose into said trouble. The Bixby fails horribly at fixing said trouble. This results in a wall of boxes or crates falling on The Bixby. This results in Hulking out. The Hulk smashes his way through walls until finally the bad guys are revealed to the cops. The Hulk runs and or jumps away. The Bixby kisses the prettiest girl in the room goodbye. The Bixby walks away to sad music. Rinse, repeat, genius! I love it. So, for no good reason at all, here are some pictures of The Hulk drinking soda. That guy on the right is Ricky. He's the co-star in an episode named "Ricky" where The Bixby be-friends a retard. Whoa Nellie, you can't go around calling people retard! Shut yo mouth! But wait, this episode was in 1978, when even the most sensitive politically correct professional scientist/doctor in the world (a.k.a. The Bixby) still thought it was perfectly okay to use that word. Weird right? The Incredible Hulk was actually a very progressive show as far as dealing with social issues goes. Well, for 1978 anyway. In the episode after "Ricky", The Bixby hangs out with some Indian guy, oh I mean Native American. Then the episode after that The Bixby butts his nose into a child abuse story. Laugh riot that one. Then he hangs out with a blind Chinese kung fu master in Chinatown. No stereotypes there. Don't you even think it! And then The Bixby gets a job at a disco where he butts his nose into some teen alcoholism. 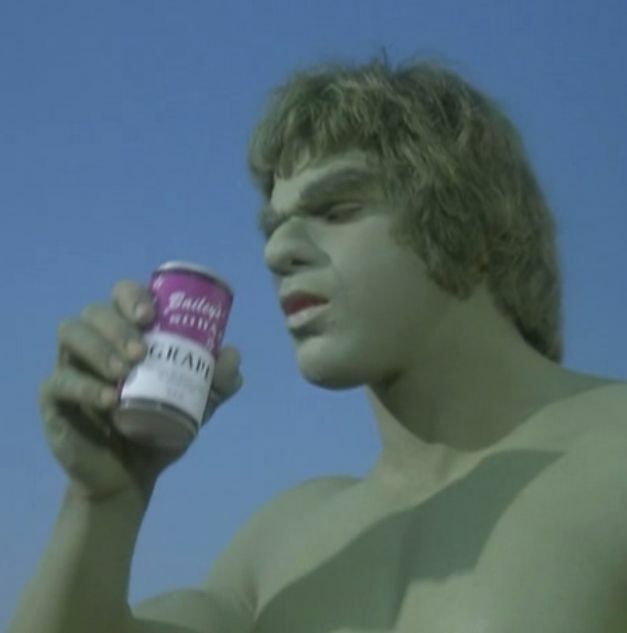 That episode goes exactly where you think it will and yes, you get to hear the-Hulk-sad-man-walking-away-music re-recorded as a disco number. Beat that The Wire! 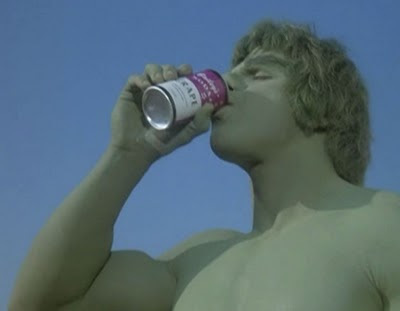 Let's just take a moment to recognize how wonderful Lou Ferrigno was/is. He never phones it in. Always delivers. You got a wall you need smashed he's gonna smash that wall better than anyone has ever smashed walls before. You got a grape soda you need drank? He's gonna drink that grape soda like it's never been drank before. The Bixby got an Emmy or two for The Incredible Hulk. Where is Ferrigno's Emmy? Tell me that. Where is Ferrigno's Emmy? p.s. The original air date of the "Ricky" episode was my birthday. Nice.